Sexism harms men as well as women, says author Aaronette White, whose new book focuses on the experiences of African American feminist men. For one man, the turning point was as straightforward as taking a women's studies course in college. For another, it was as shocking as being shot by the wife he'd battered for years. For both men, these events marked the beginning of a process of questioning their manhood that led them to a new definition of masculinity centered around the values of feminism. Although the details are different, transformation is a theme that runs through the life stories of 20 black men whose experiences are presented in the new book Ain't I a Feminist? African American Men Speak Out on Fatherhood, Friendship, Forgiveness, and Freedom (Albany, NY: State University New York Press; 2008). 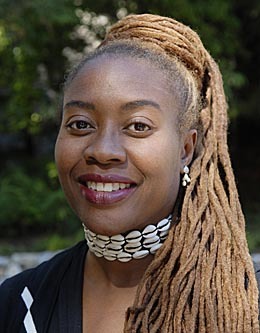 The book is an interview-based study of contemporary African American feminist men that underscores how profoundly sexism harms men as well as women, said author Aaronette M. White, associate professor of psychology at the University of California, Santa Cruz. "These men challenge narrow definitions of manhood and masculinity," said White. "They challenge us to broaden our definition of what it means to be a man." And their triumphs signal a path that has the potential to overcome persistent problems of domestic violence, broken families, and estranged relationships, she said. Feminists, according to White's definition, believe there is an unfair imbalance of power between women and men and that the imbalance ought to be corrected, and they are willing to take actions, privately and publicly, to correct the imbalance. For black men, feminism can be a positive force that enhances romantic relationships, friendships with other men, and relationships with children, said White, whose findings are based on in-depth interviews and an extensive written survey administered to each participant. Her subjects, whose identities are not revealed in the book, were hand-selected from a pool of about 50 men, all of whom were self-identified feminists. "These men have defied the odds," said White, whose book breaks new ground in the empirical study of black feminist men. "Their lives help define what it means to be a feminist and an ethical human being." The book's title, Ain't I a Feminist?, refers to a phrase attributed to Sojourner Truth, the former slave and abolitionist who delivered a powerful speech entitled "Ain't I a Woman?" to the Ohio Women's Rights Convention in 1851. During the political struggle over the 15th Amendment, which ultimately gave black men the right to vote, Truth argued that women, too, deserved access to the ballot--and not only white women. "I consider these men to be the sons of Sojourner Truth, because they refuse to place race above gender, or gender above race," White said of her subjects. "Feminism benefits everyone. Feminism is truly for everyone." But being a black man and a feminist isn't easy, said White, noting that feminist women friends provided valuable support and inspiration to feminist men as the men challenge social norms in their search for nontraditional ways of being "masculine." "One of the things they have to come to grips with is their sexuality and their own internalized homophobia, because there's a whole world out there that believes that if a man is a feminist, he must be gay," she said. "They have to feel strong in whatever their sexuality is." Another theme that emerged from the interviews was empathy for mothers. The men also embrace feminist parenting practices that oppose corporal punishment, and they believe a man's role includes nurturing the emotional well-being of family members and not just providing financial support. Finally, they value a vision of "politically conscious" parenting that encompasses anti-racist and anti-homophobic childrearing. White, who concedes that she began the project with "a healthy dose of skepticism about the sincerity of men's involvement in feminism," said her research has convinced her of the transformative power of feminism in the lives of black men in particular, and men in general. "We need to begin teaching women's studies and discussing gender issues in preschool and elementary grades to promote feminist values of nonviolence, humility, empathy, and accountability," said White. "And we need to reform workplace policies that bar men from participating fully in family life. We need paid family leave, we need to enforce equal pay for equal work." "Becoming a feminist includes a combination of individual and institutional changes that provide opportunities for women and men to think and act in ways that challenge sexist, racist, and homophobic norms," she said. Note to journalists: White may be reached at (831) 459-3557 or via e-mail at awhite1@ucsc.edu.